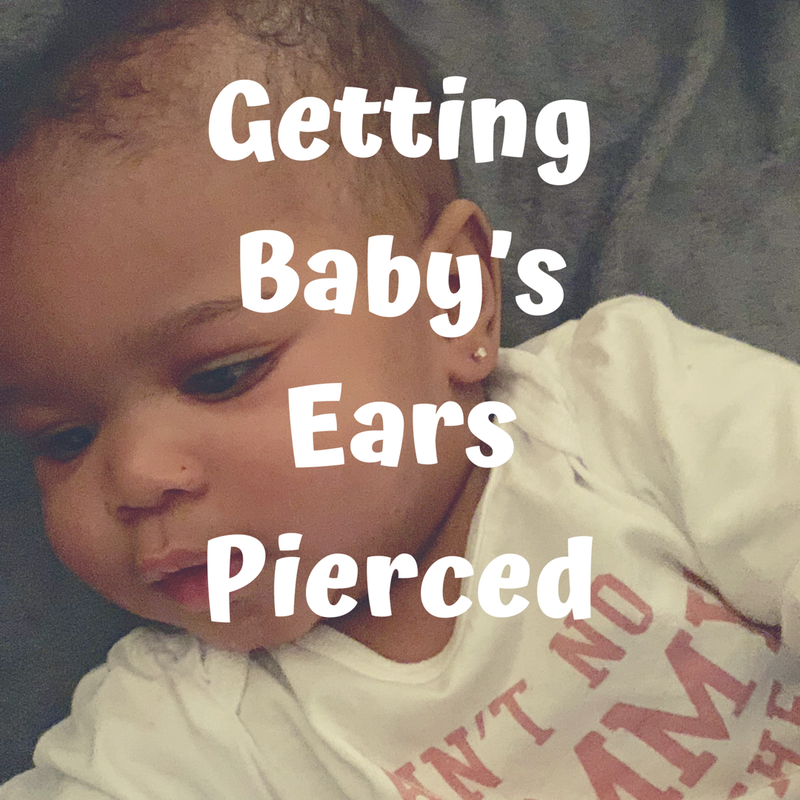 Today I’m going to be talking about our experience when Kali got her ears pierced. We wanted to get it done sooner than 5 months but the day we wanted to go, Kali had gotten her first cold. I’m not sure if getting her ears pierced would have effected that in any way but we both decided that she could wait. I randomly decided to take her on a Saturday since I wasn’t doing anything expect letting Kali roll around on the blanket. We went to the mall and got in line at Claire’s to get her ears pierced. It’s funny because the baby in front of us had the same birthday as Kali. I signed a form and they proceeded to get everything ready (I thought they would verify if she had her dpt shots but they didn’t). I’m not sure if it was overlooked since they were busy or if they don’t check at all. I’d read that Claire’s makes sure that they had their shots. Have you all heard about that? I’m not sure how dpt shots and ear piercing are even related? Let me know below. The associate cleaned her hands and the jewelry that I chose from their selection. They suggested 14k gold posts. She put on gloves and cleaned Kali’s ears as Kali sat on my lap. Then she marked them and asked me if I was okay with where the marks were. She then told me how to hold Kali’s arms and how to hold her head. We went over how to clean her piercing and how often it should be done which was three times a day for the first three weeks. I was to wash my hands with antibacterial soap, saturate a cotton ball or q-tip with the cleaning solution from Claire’s. Push the piercing back and forth so that the solution would be able to get into the piercing. And third the earring two to three times. Kali was already being fussy and not sitting still when the associate was marking her ear so I was getting a little nervous about how to hold her while she got her ears pierced. She moved a lot and made it a little very difficult for the associate to pierce them but the associate was very patient and I’m very grateful for that. That Saturday I realized how strong Kali really was when I tried to restrain her. I was flexing my muscles and sweating lol. Kali cried after that of course but she looked so cute with her new earrings. She also ate after that lol. Here’s a pic. 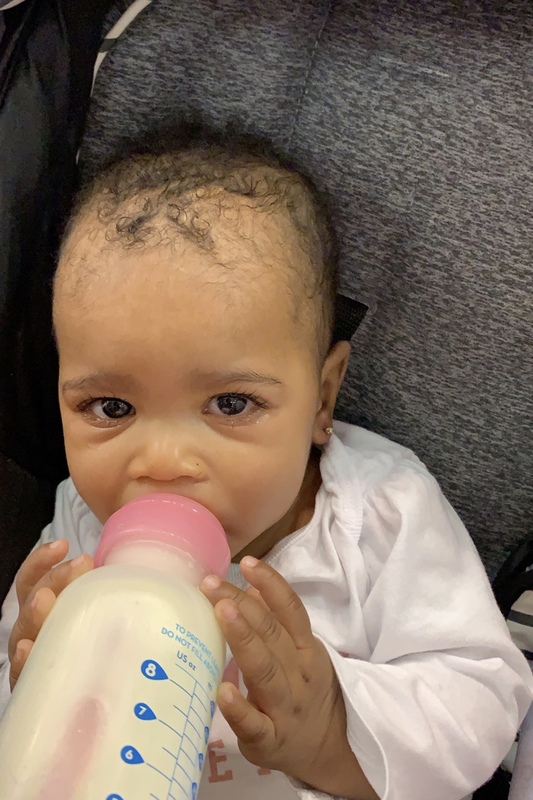 When did you get your baby’s ear pierced? How did you decide where you would go to get them done? How was your experience? I’m dying to know! Let me know in the comments!